MTN Group Ltd.’s Rwanda unit has signed a$56.20 million (50 billion francs) loan with eight local banks. 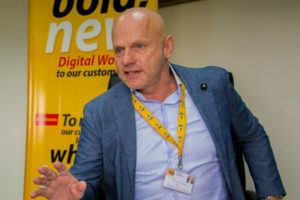 MTN Rwanda, which had close to 4.5 million subscribers in September, said the loan is earmarked for a capital expenditure program for the next two years targeting expansion and modernization of the network and related IT systems. Diatile Lily Zondo, the firm’s Chief Financial Officer, said the funds will also go into covering operating costs which have been going up over the years as the firm increases services portfolio. The loan was provided by a syndicate of eight banks comprising Ecobank Rwanda, Cogebanque, BPR Atlas Mara, I&M Bank, Bank of Kigali, KCB Bank, Equity Bank and GT Trust Bank. According to Ecobank Rwanda Managing Director, Alice Kilonzo, the loan was oversubscribed by 127 per cent. Last year, Rwanda’s telecom industry regulator has fined MTN Rwanda, for running its IT services outside the country in breach of its license. MTN Rwanda says it is the country’s leading mobile operator, with over 4 million subscribers. It is 80 percent owned by MTN Group while the remaining 20 percent is listed on the Rwanda Securities Exchange. Posted by Steven Addamah on November 29, 2018. Filed under Business. You can follow any responses to this entry through the RSS 2.0. Both comments and pings are currently closed.